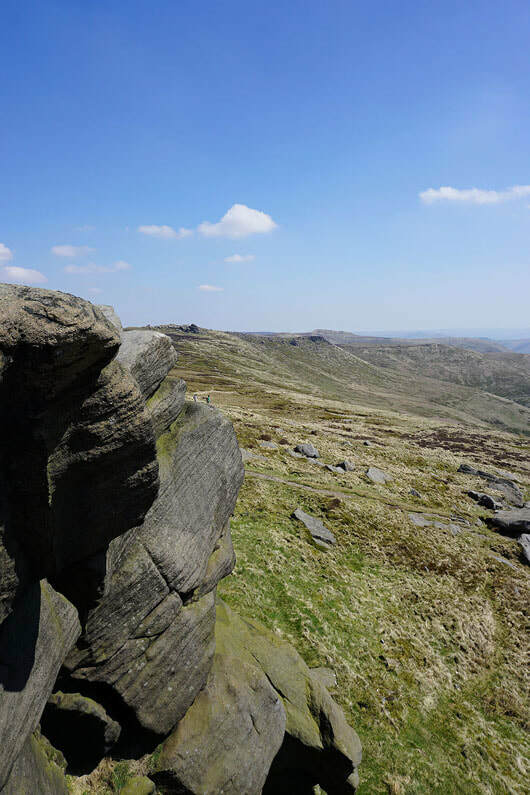 It's a bank holiday weekend and the weather has come up trumps. 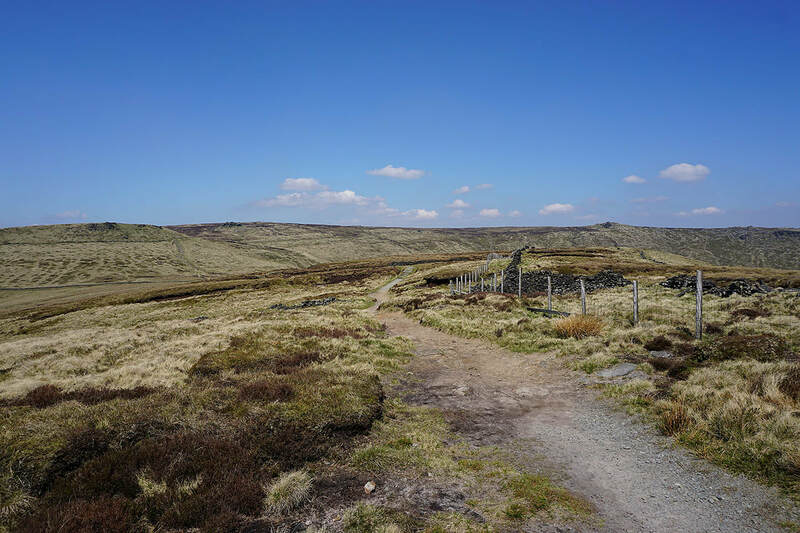 All three days are forecast to be warm and sunny, more like mid-summer than early May. 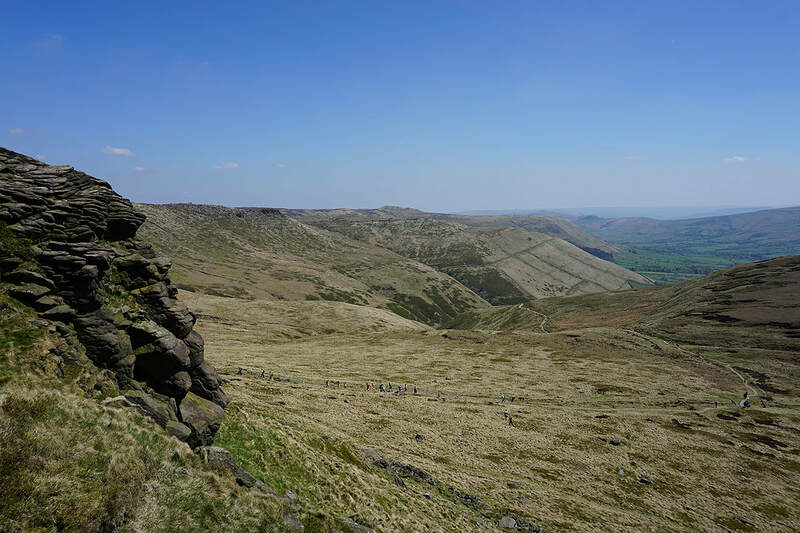 I was almost tempted to go somewhere on all three days but on two of them will be more than enough, especially given how warm it's going to be. 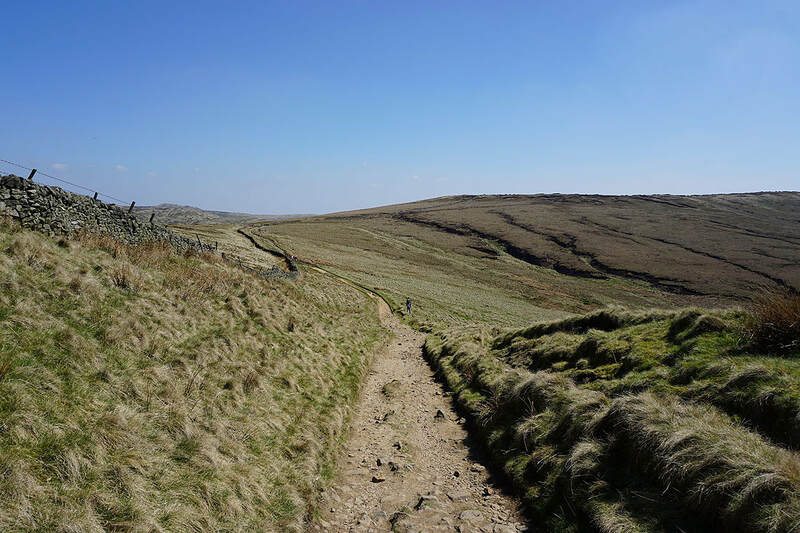 I'm sure that I'll have expended more than enough energy by the end of tomorrow. 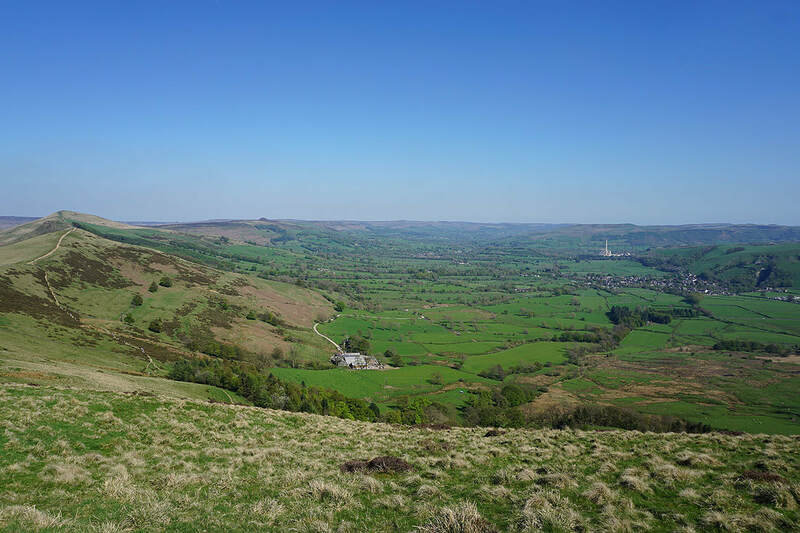 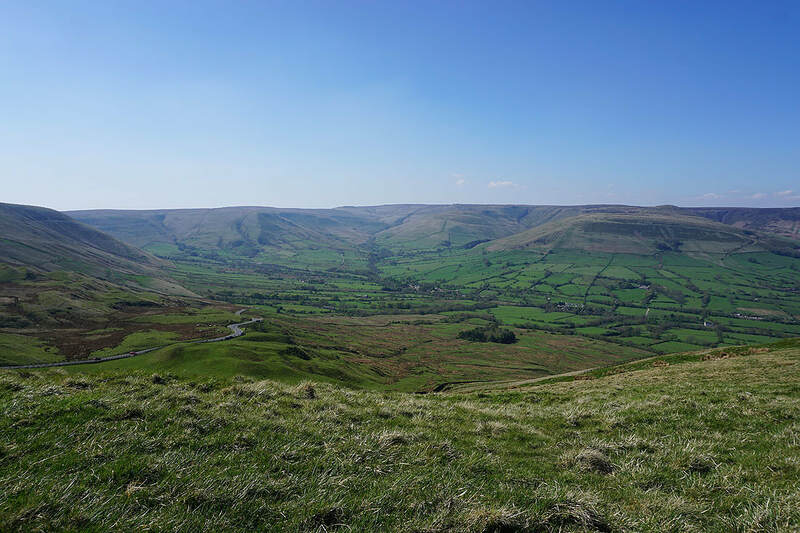 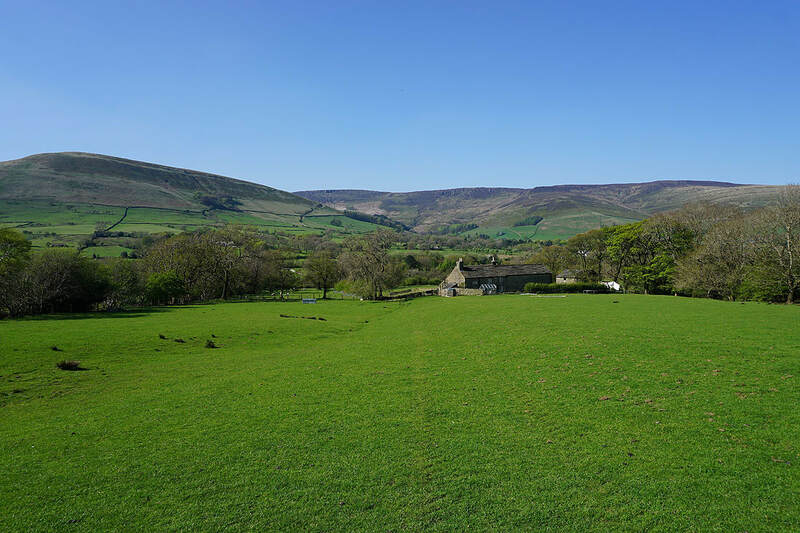 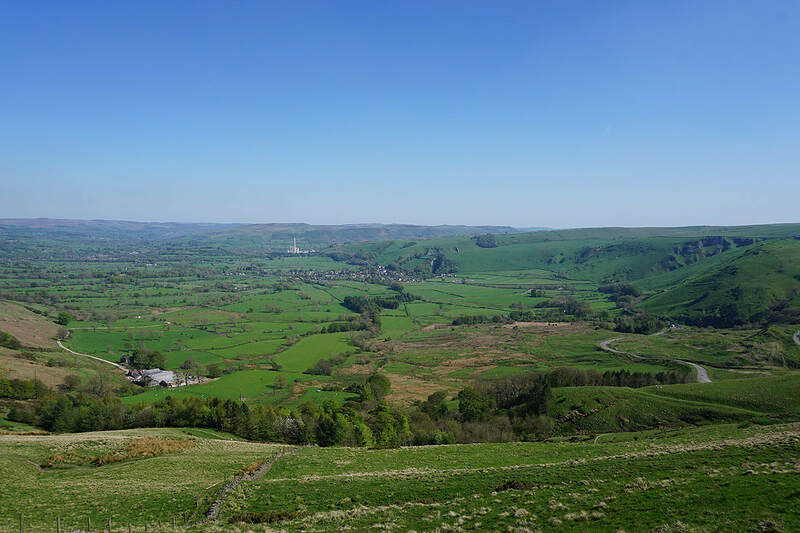 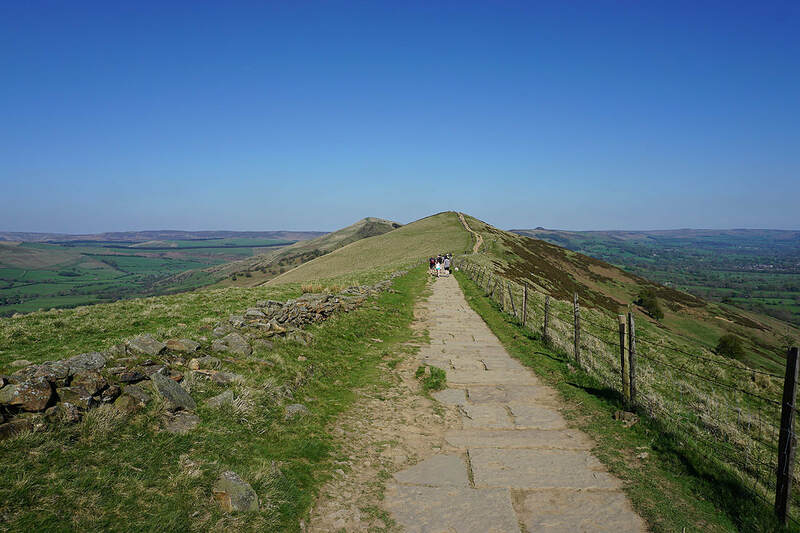 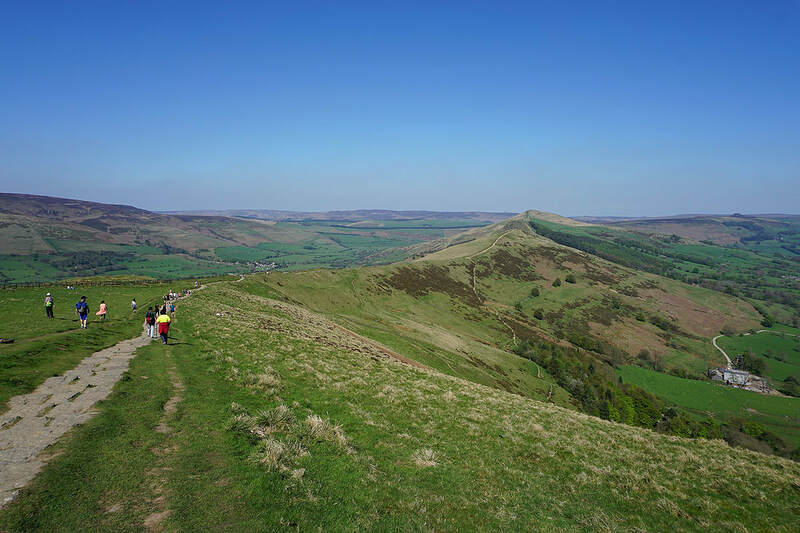 Today, it's the Peak District and a busy Edale for a walk around the head of the valley. 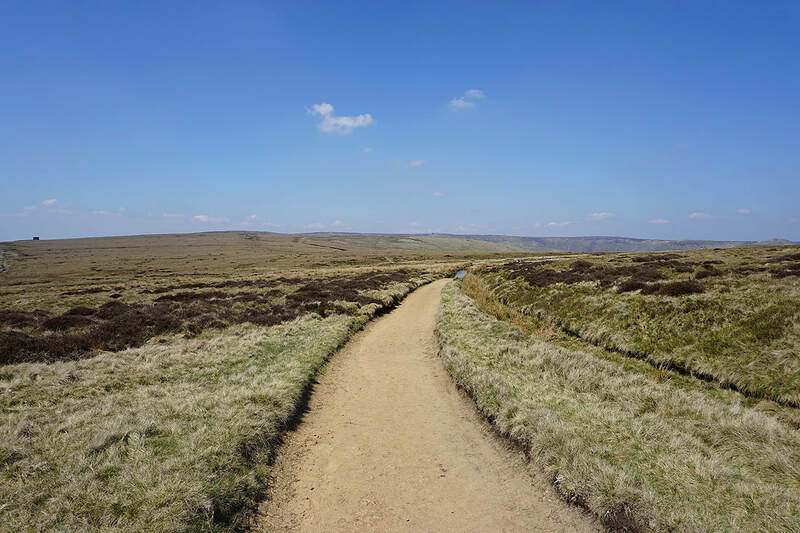 A "variation on a theme" of a route that I've done several times now. 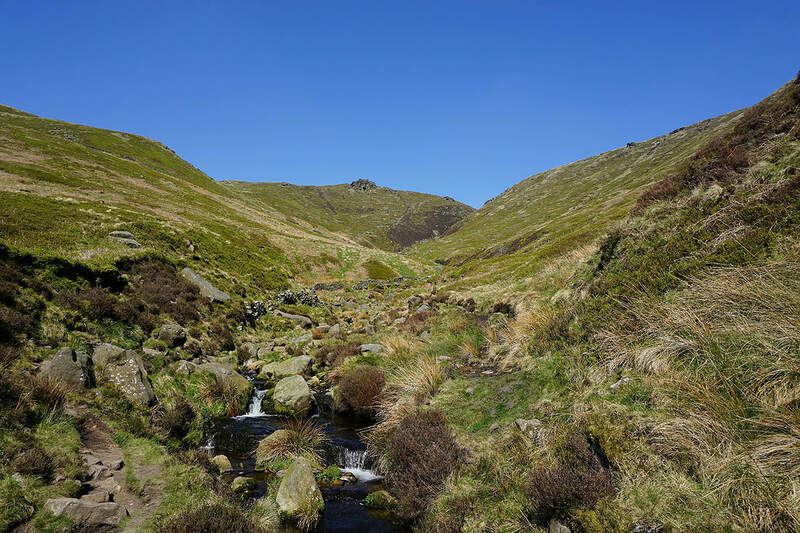 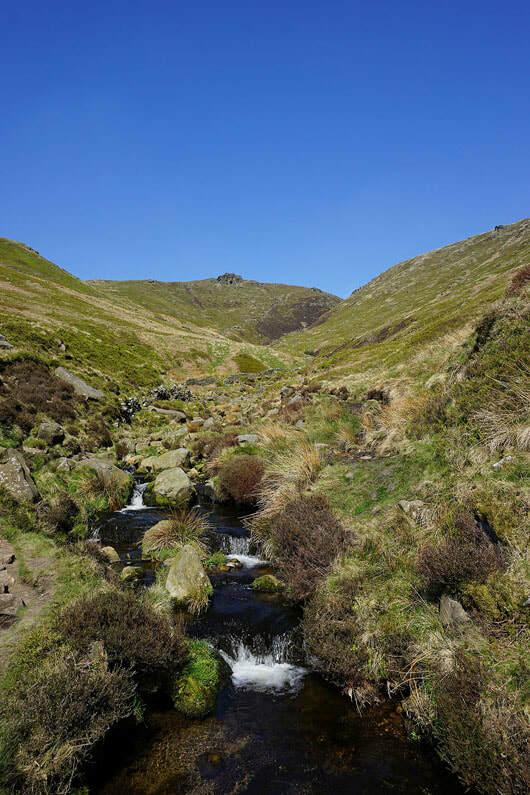 A first climb up Crowden Clough was a delight, I took in Swine's Back for the first time as well and included Mam Tor on this occasion. 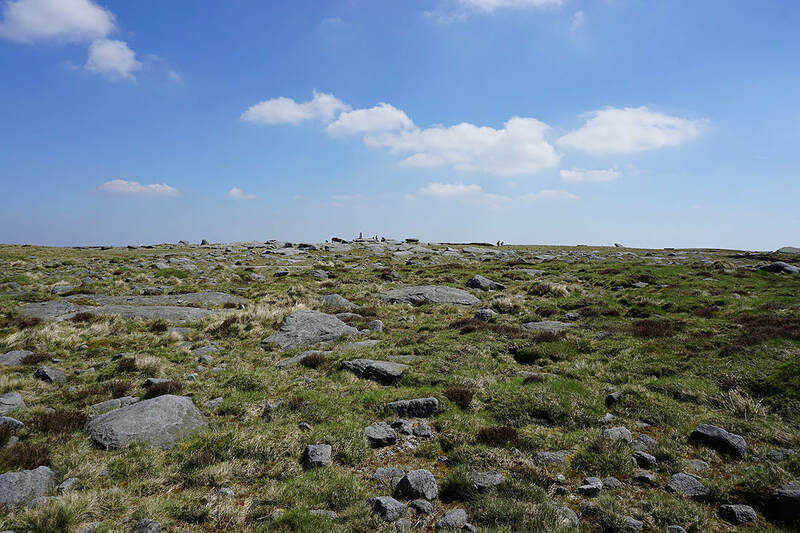 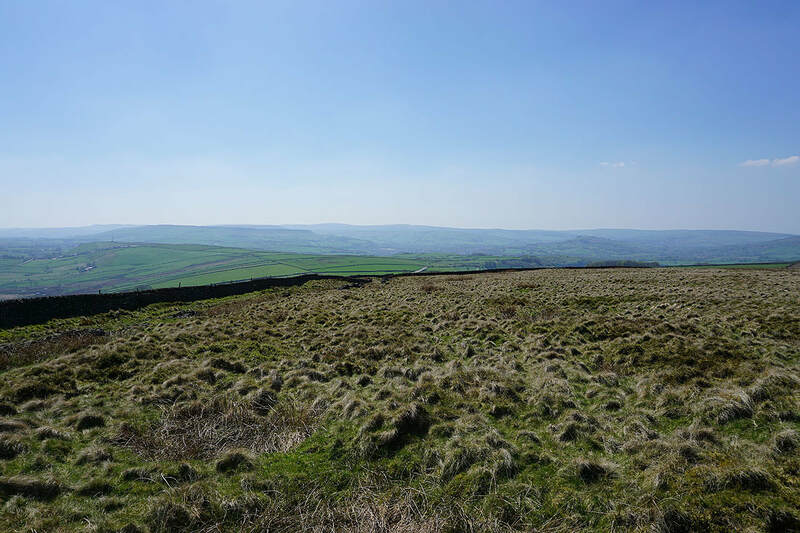 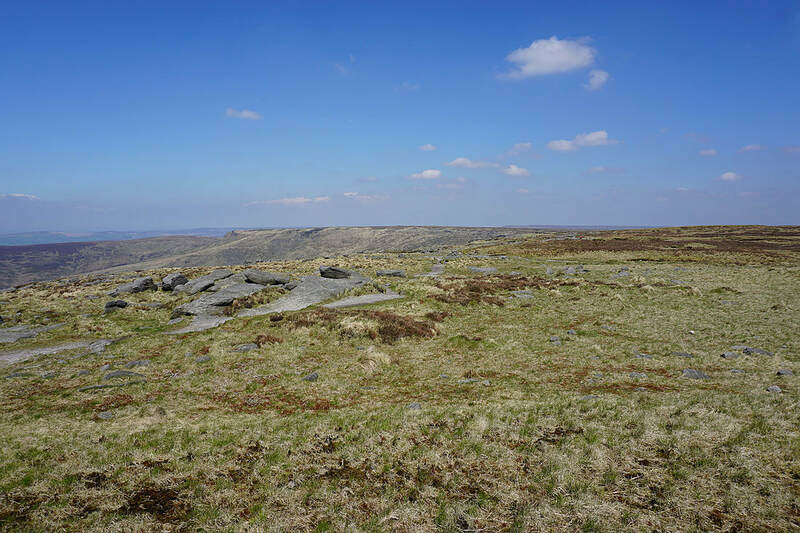 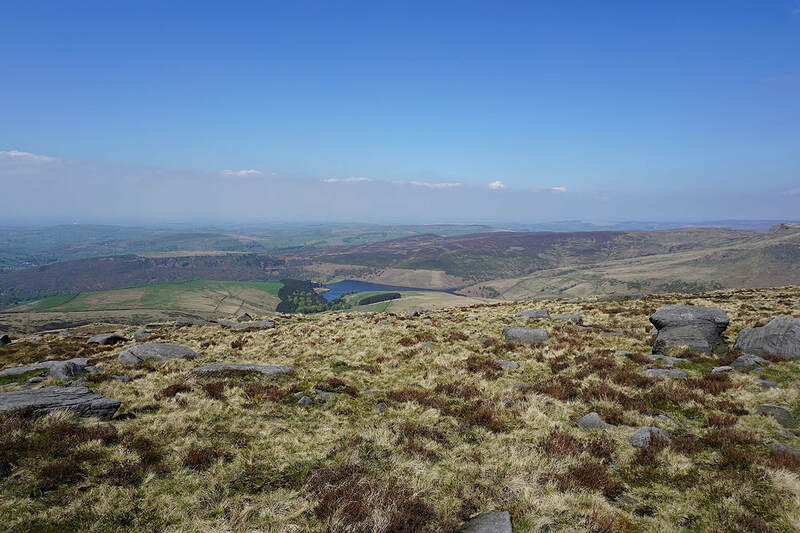 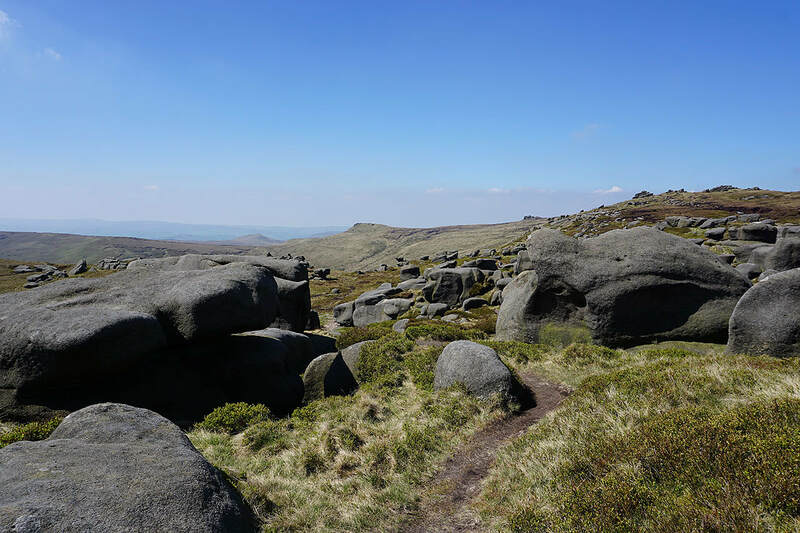 The forecast proved to be correct with lots of sunshine, only a little cloud, a bit of a haze and enough breeze to make it a perfect day being up on the moors. 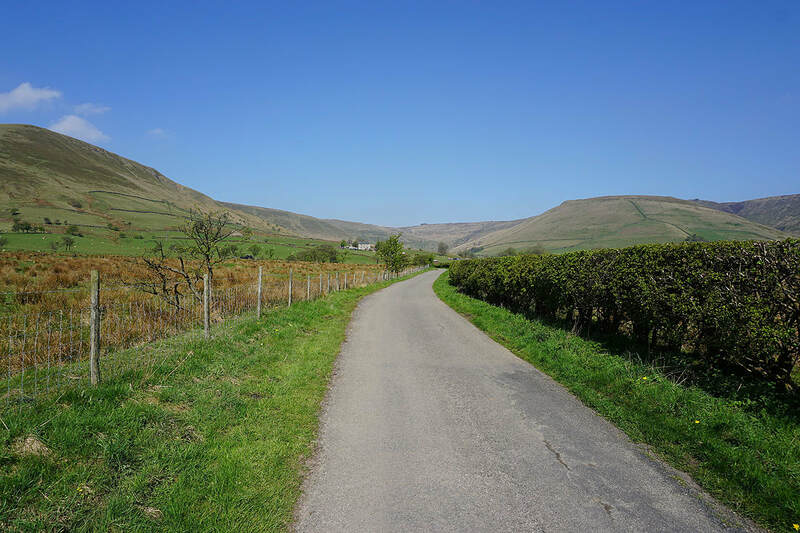 From the car park in Barber Booth I walked north up the road to its end at Upper Booth and took the footpath up Crowden Clough. 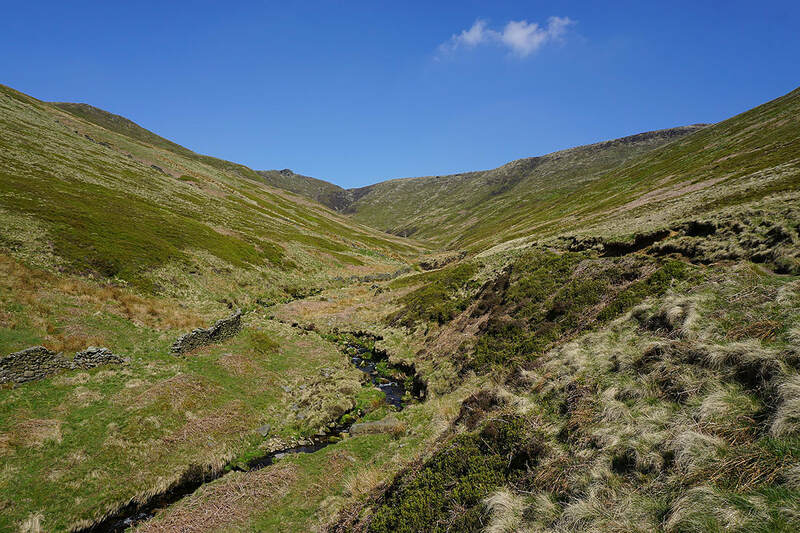 There's great scenery as the path weaves its way back and forth across the brook. 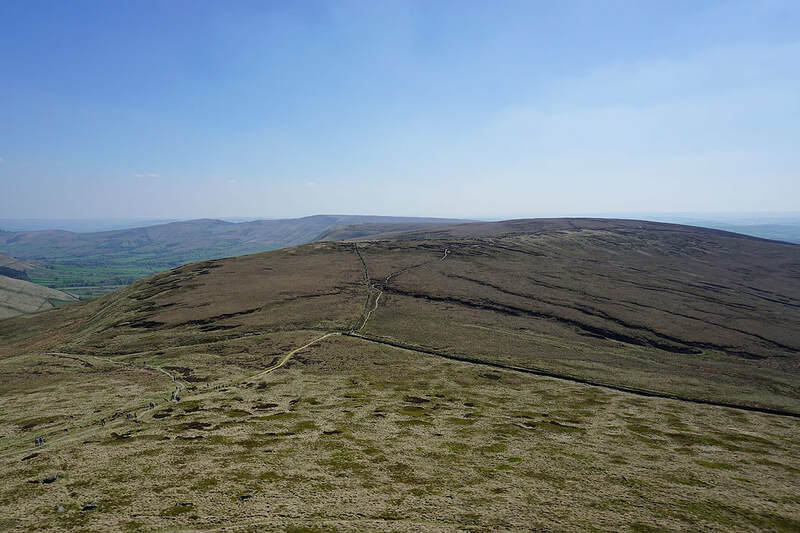 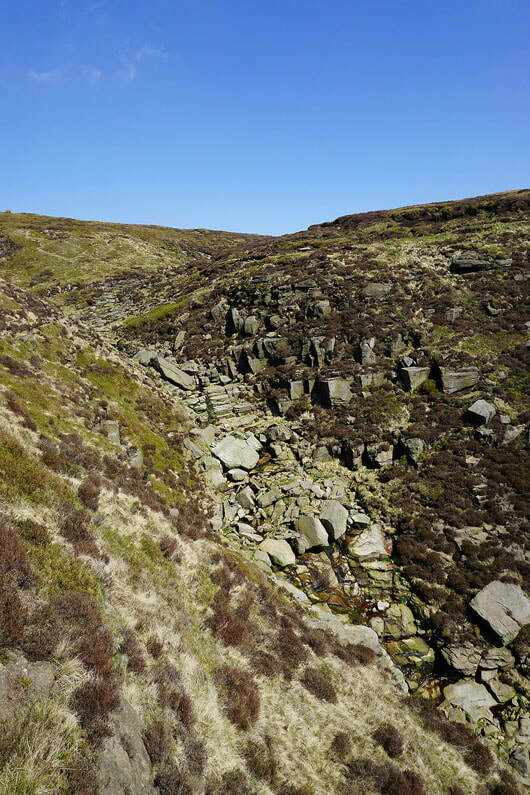 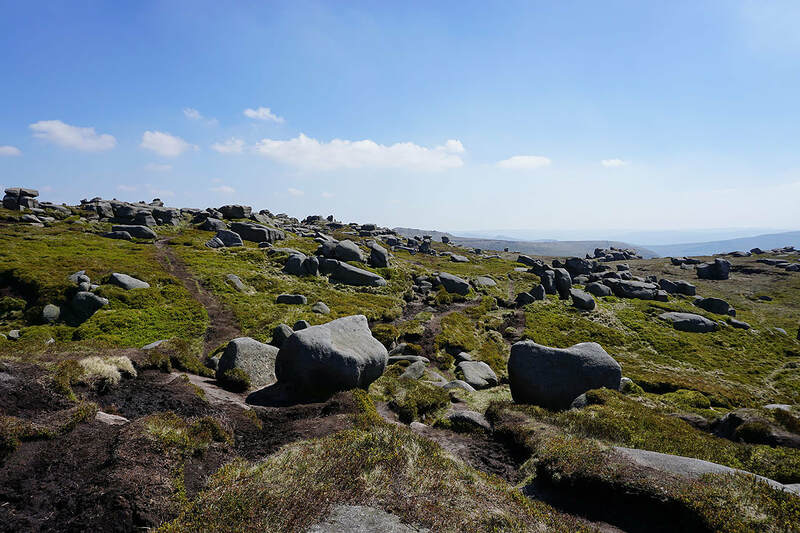 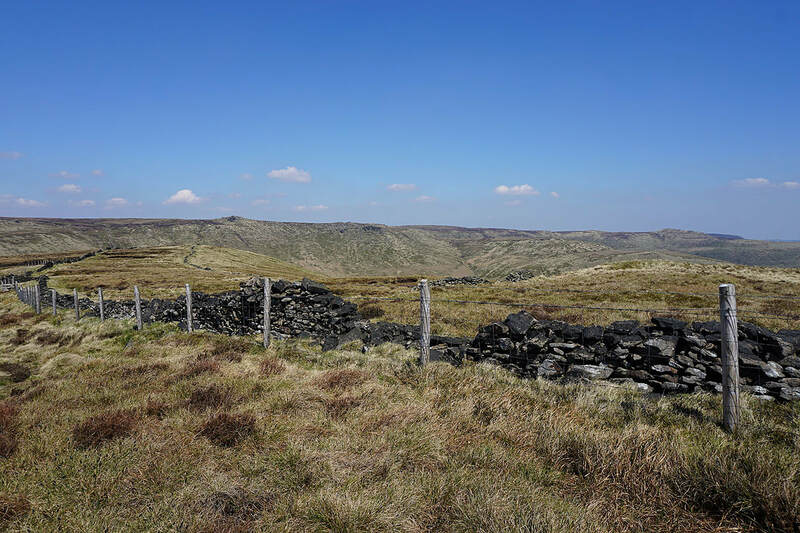 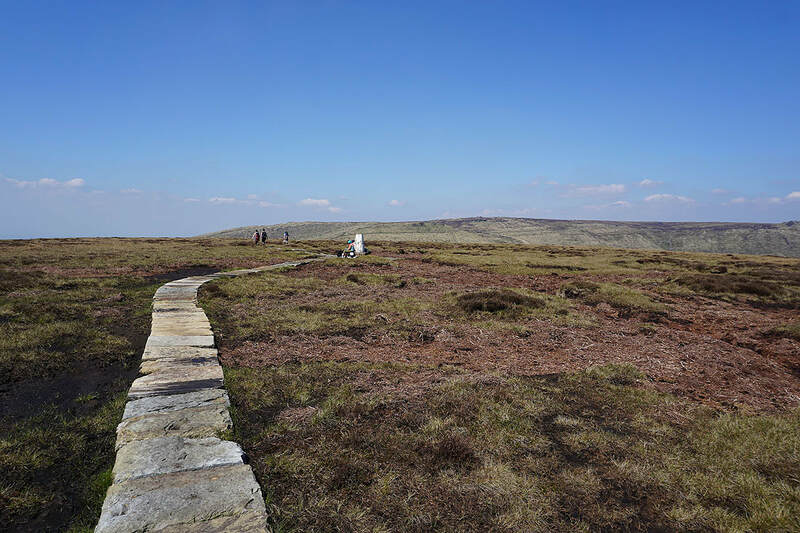 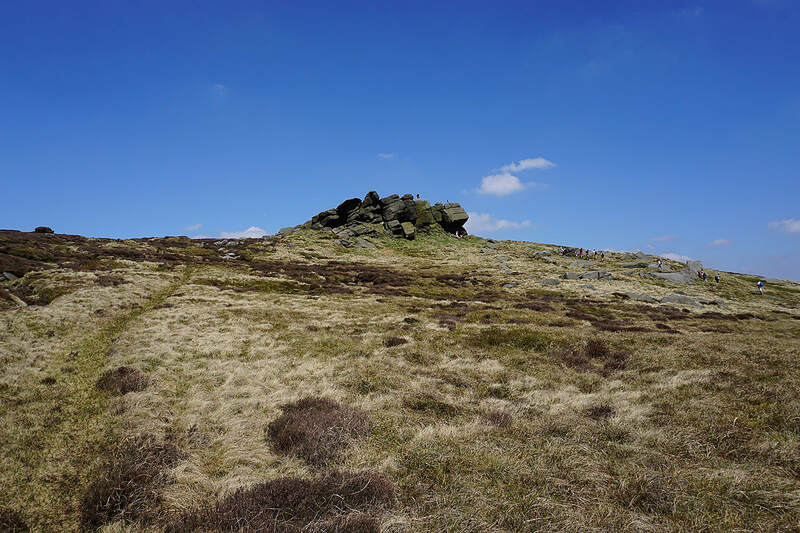 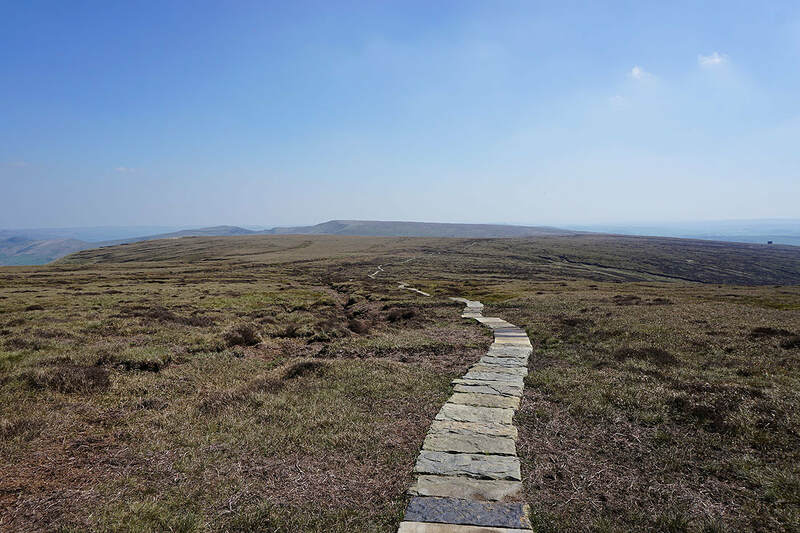 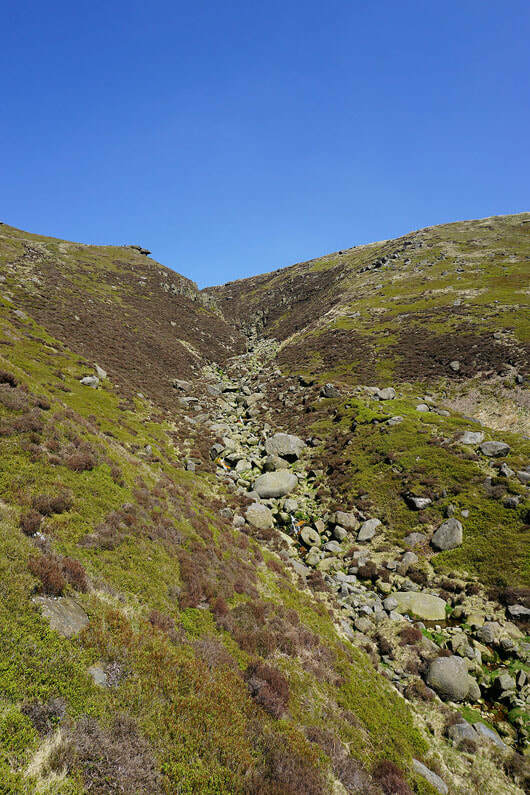 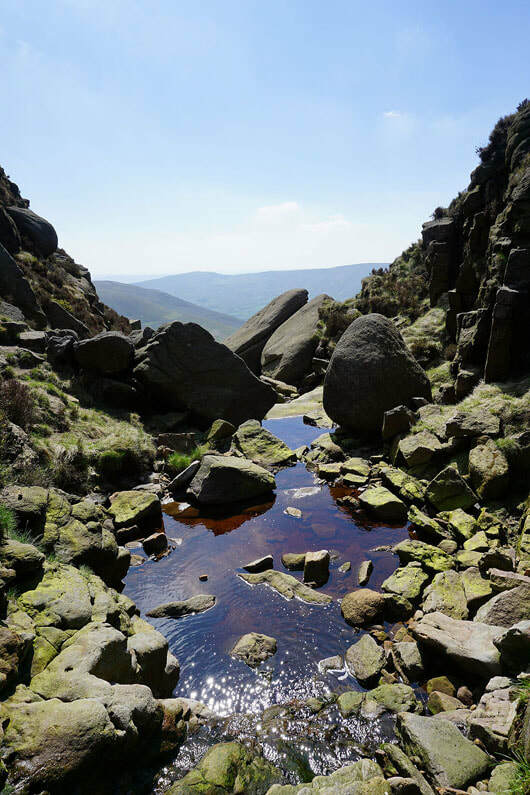 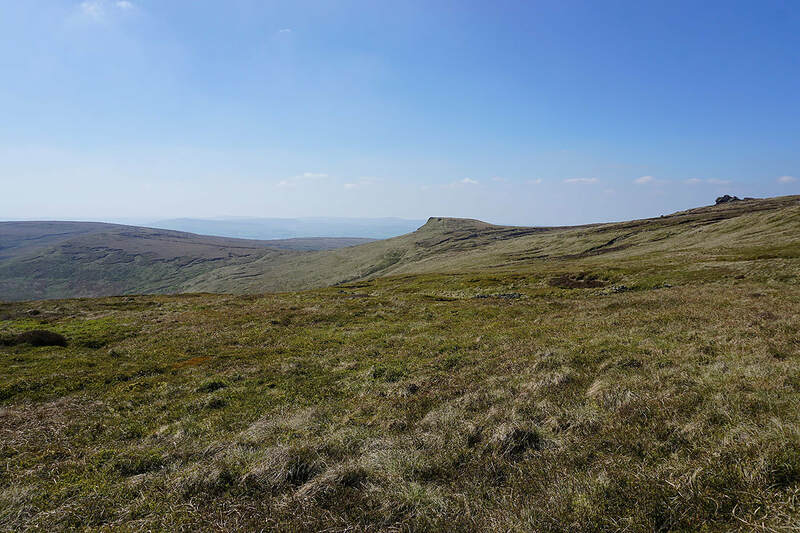 As the top is neared the path leaves the bed of the clough and exits it to meet the edge top path to Crowden Tower. 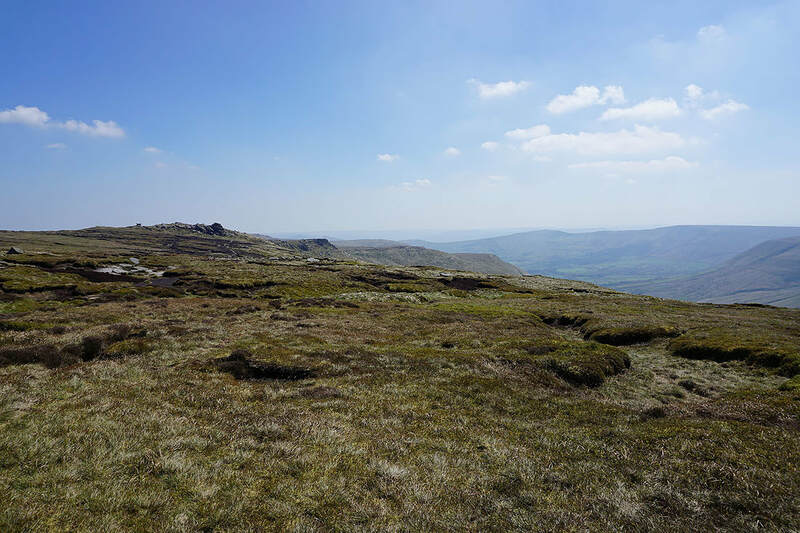 From Crowden Tower I passed the Wool Packs, Pym Chair and Noe Stool to arrive at the trig point on Kinder Low, where I stopped for lunch. 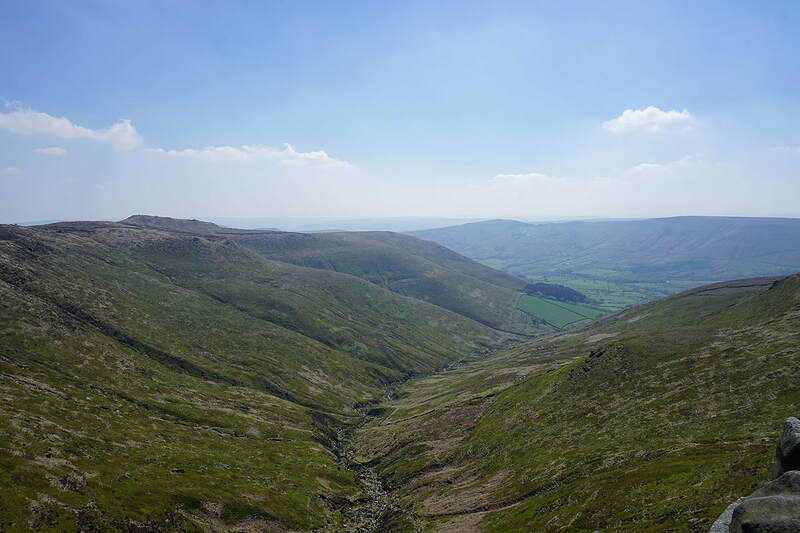 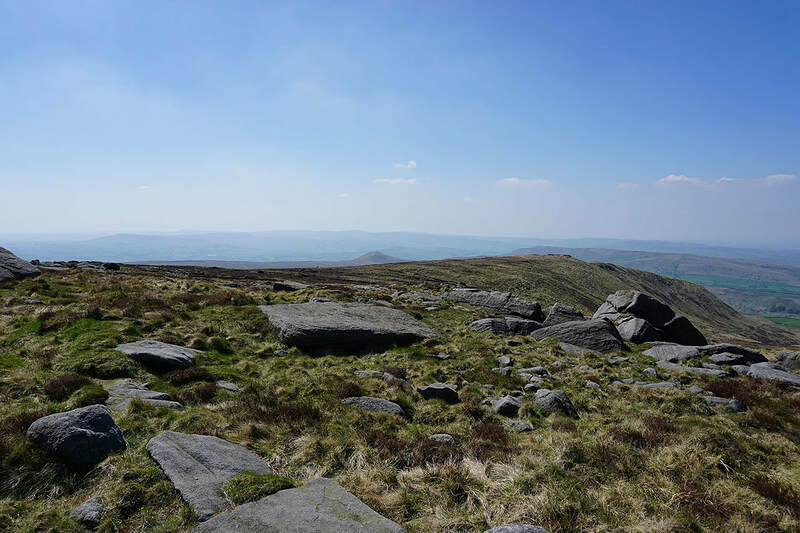 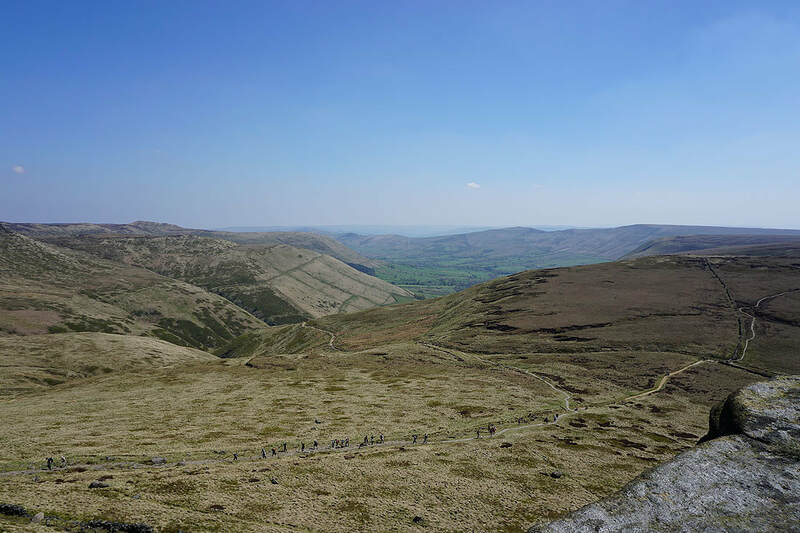 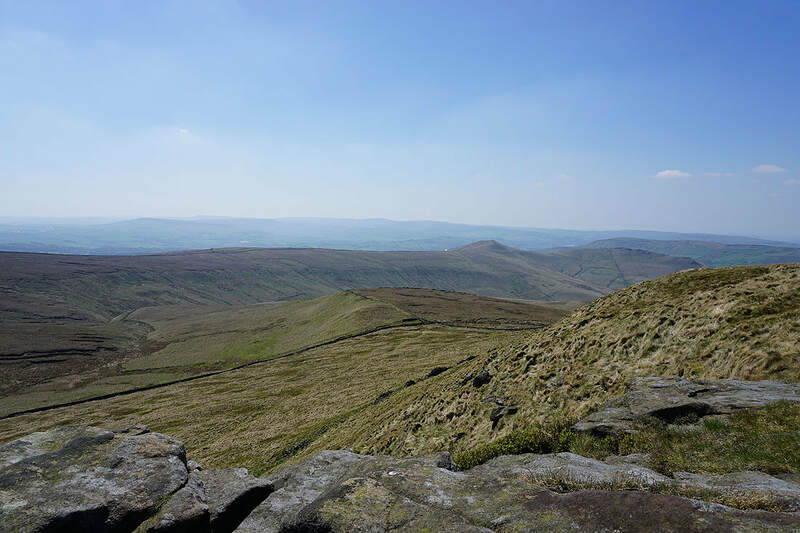 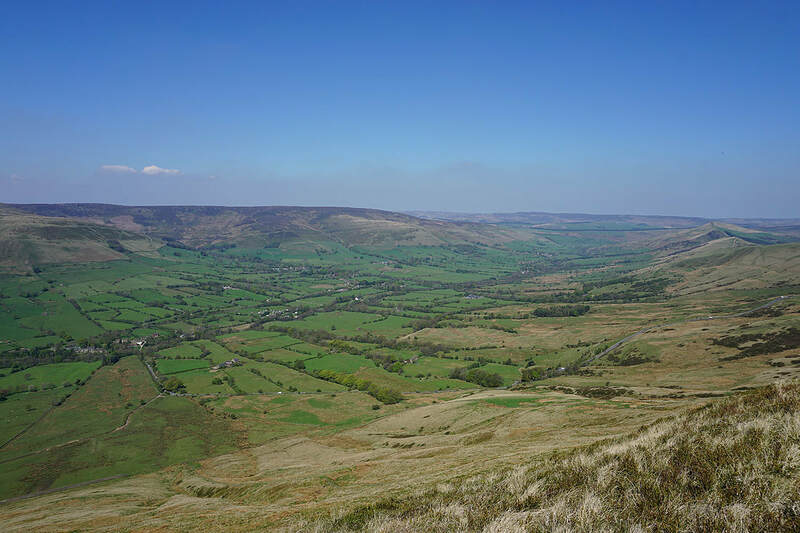 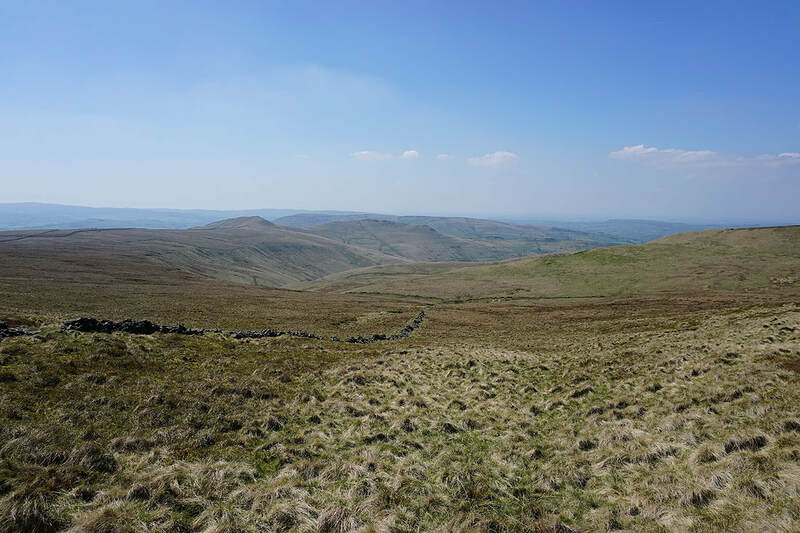 It was now time to head south round the head of the valley, so I took the path to Edale Rocks and Swine's Back down to the bridleway up from Coldwell Clough at Edale Cross. 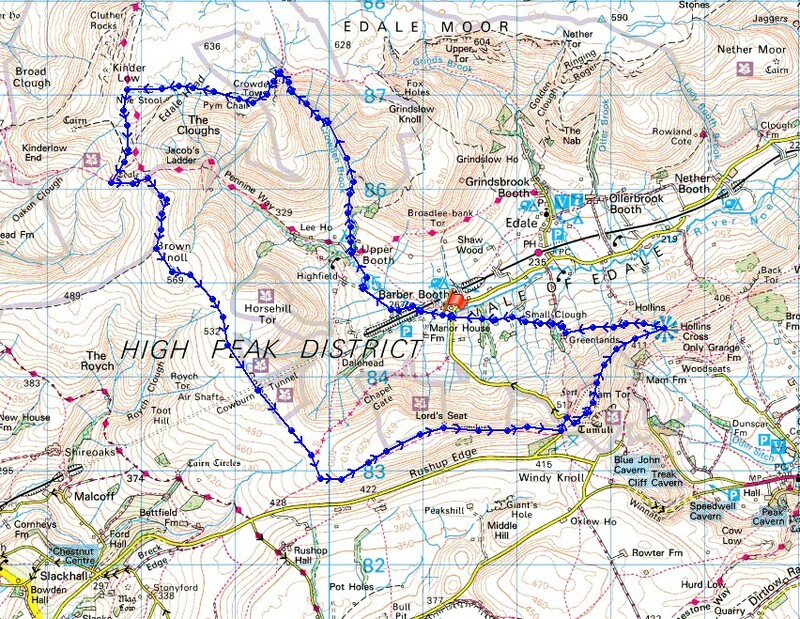 After following this east for a short distance I left it for the path to Brown Knoll, then on to and past the trig point to reach the Chapel Gate byway. 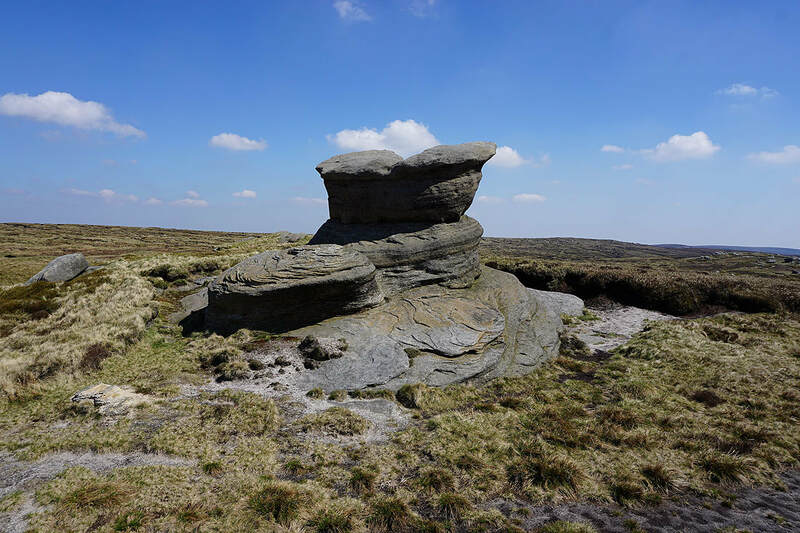 I was on this briefly until it met the bridleway up Rushup Edge, which I took and the footpath to its top, Lord's Seat. 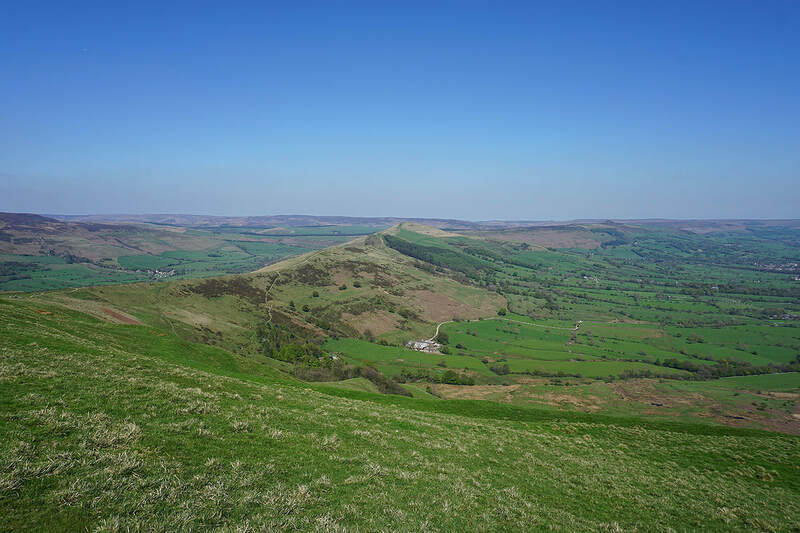 I then made my way down to the road at Mam Nick and climbed to the summit of Mam Tor. 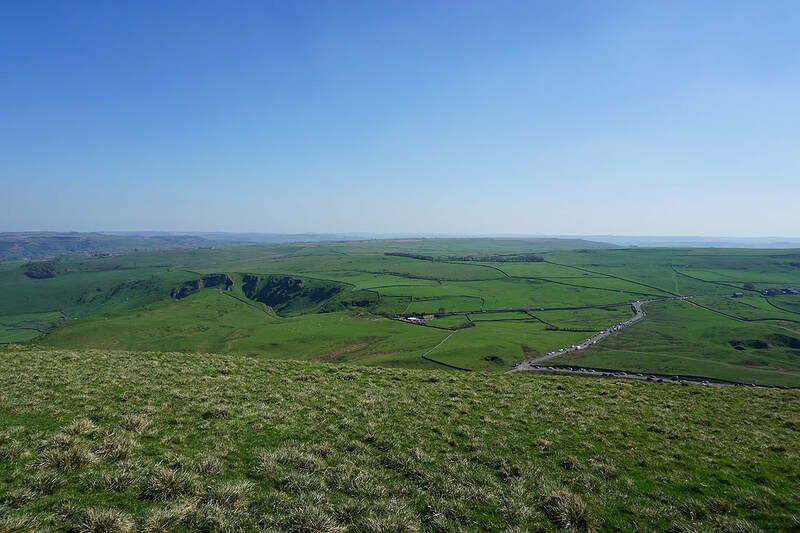 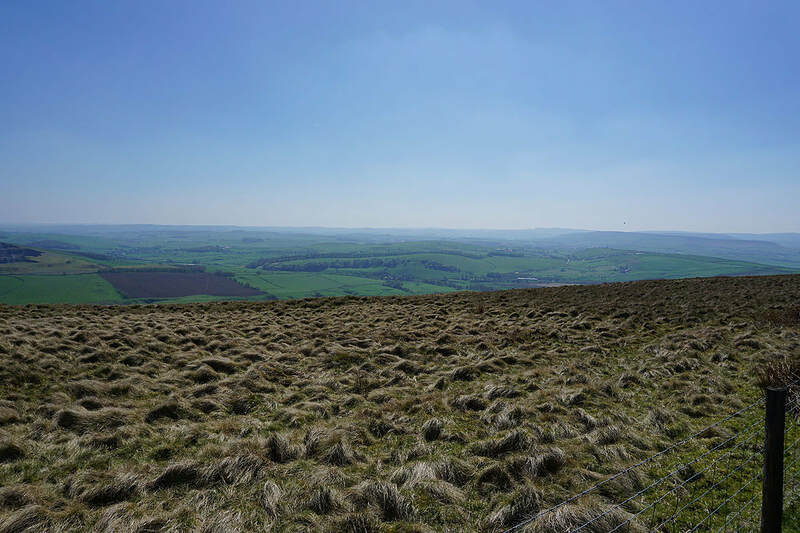 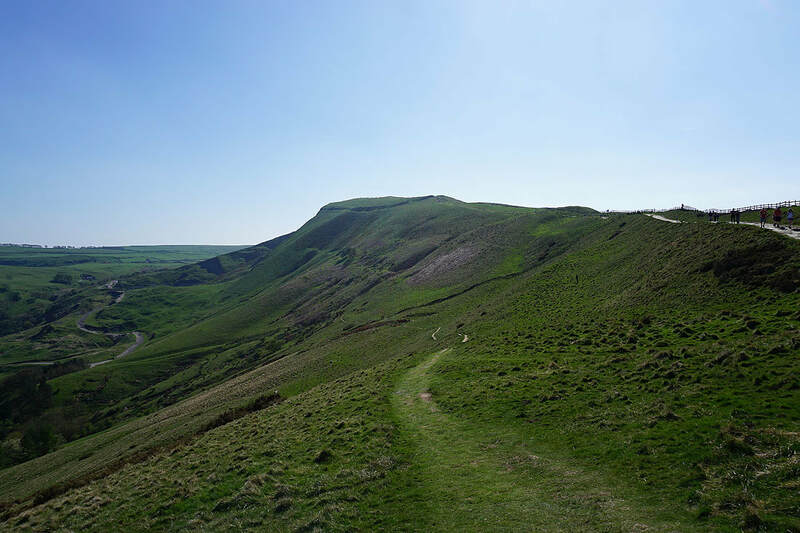 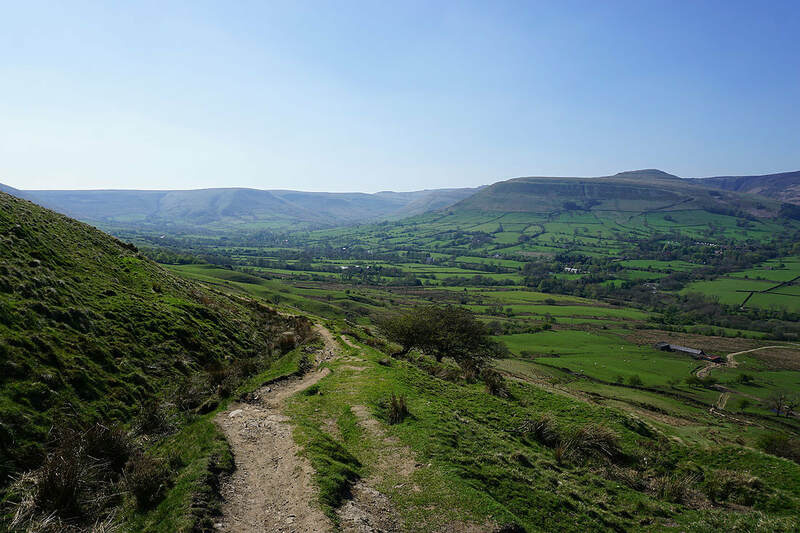 I followed the Great Ridge east from Mam Tor to Hollins Cross where I took the bridleway down to Greenlands. 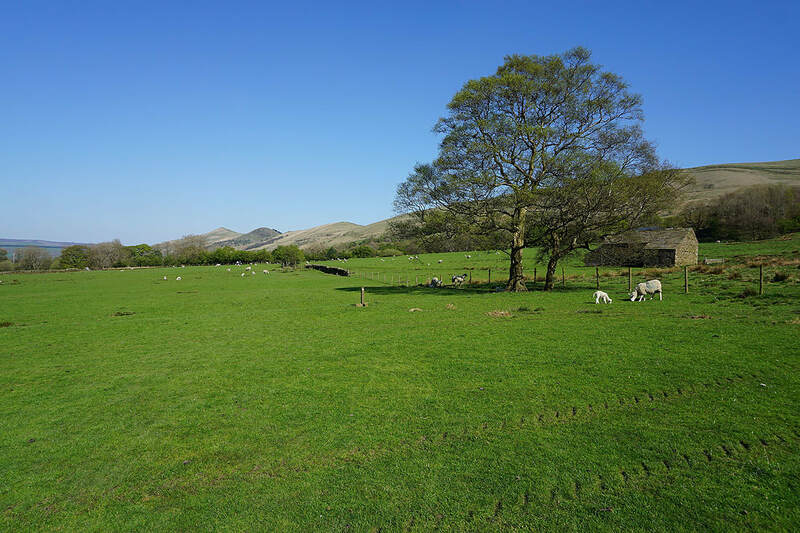 There was a walk down the road from there to meet a footpath on the left that made its way west across fields back to Barber Booth. 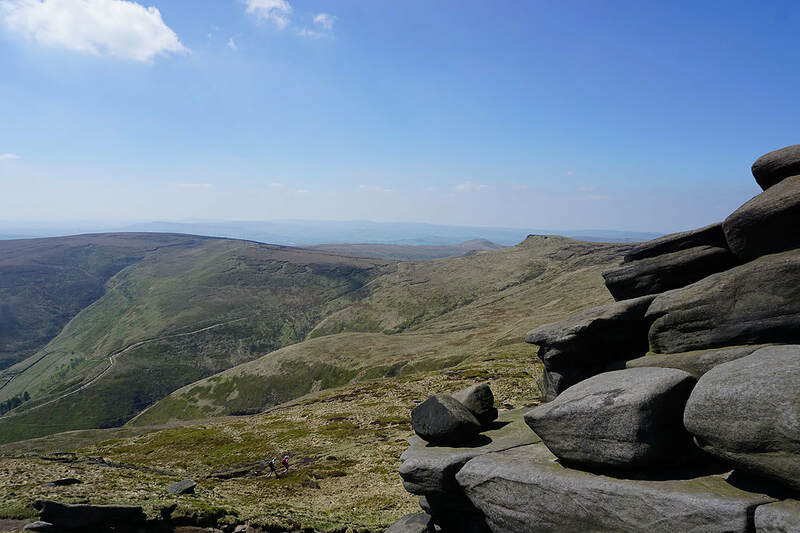 ..and Kinder Scout from Swine's Back. 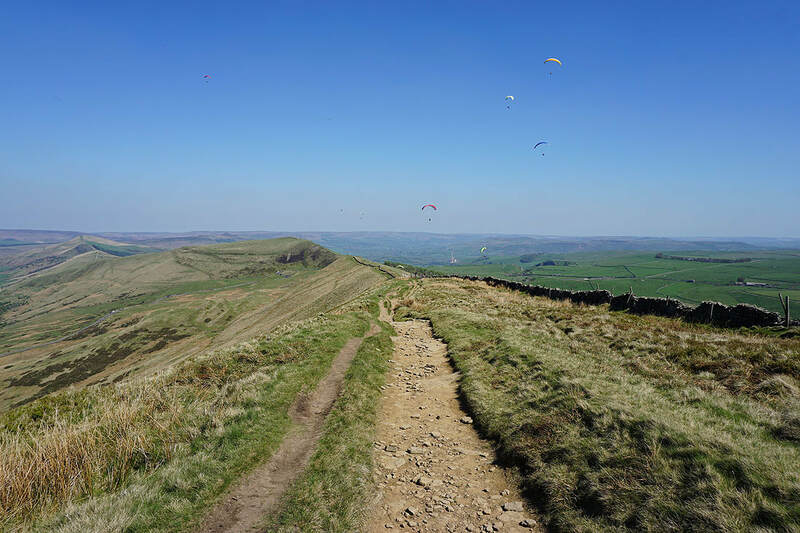 The path from Jacob's Ladder is really busy. 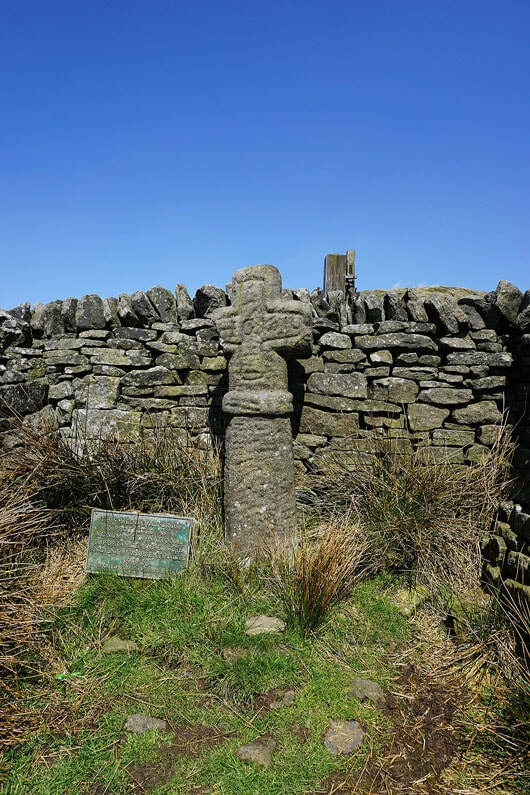 Edale Cross. 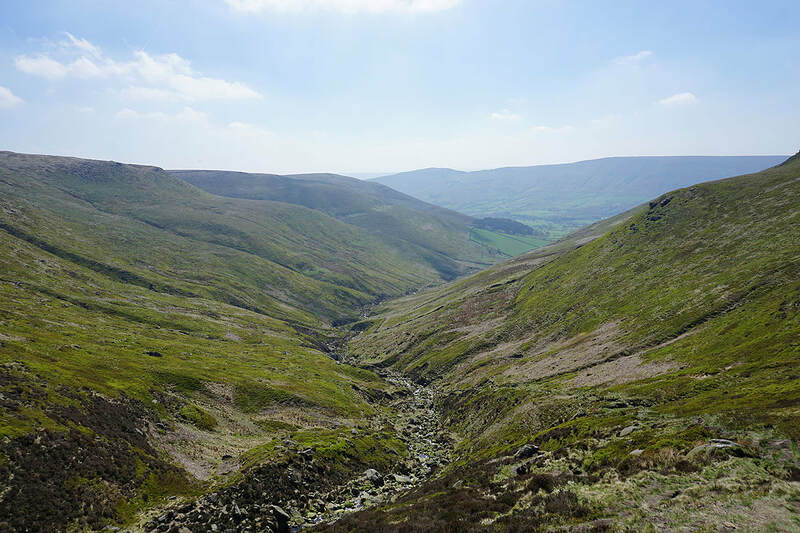 Just off the bridleway up from Coldwell Clough. 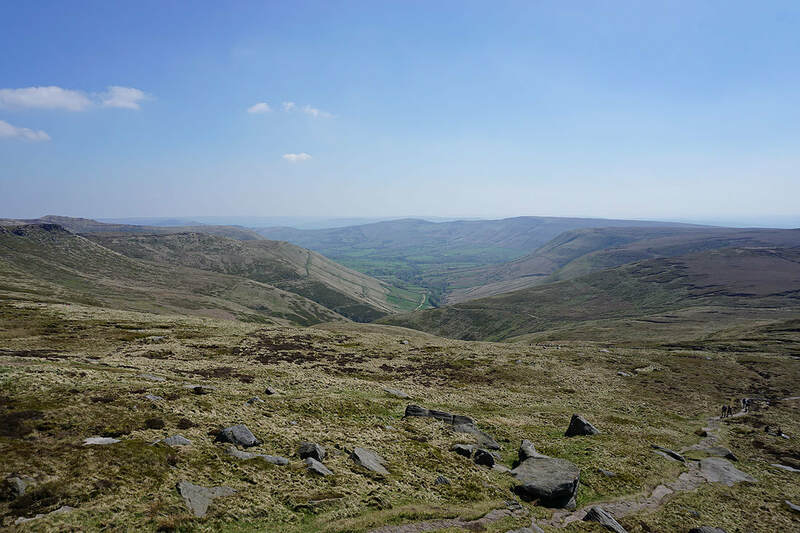 and looking back to the southern slopes of Kinder Scout.. 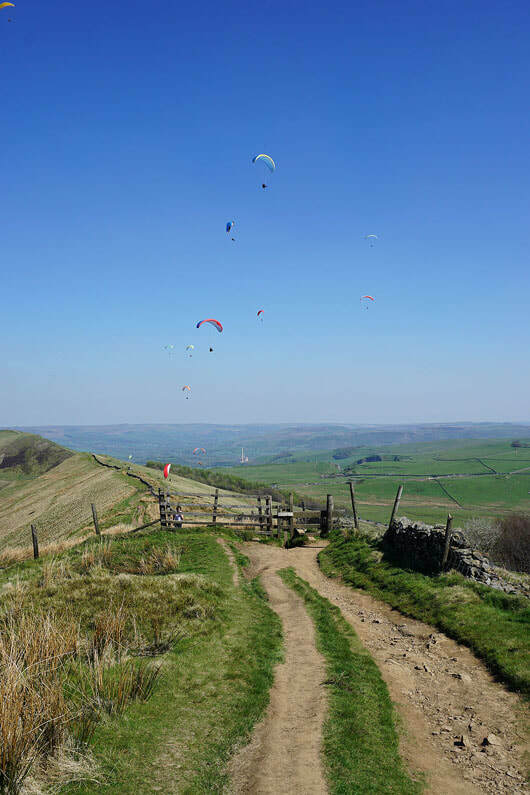 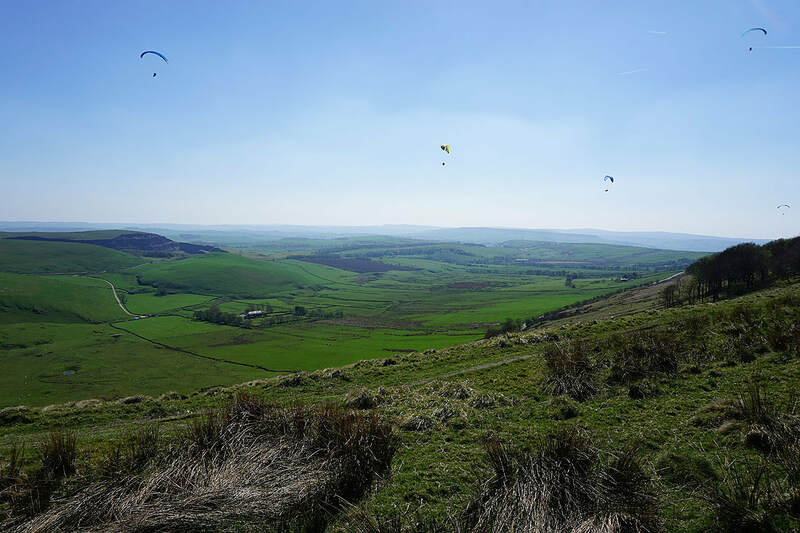 I've been able to see paragliders on Rushup Edge for a while. 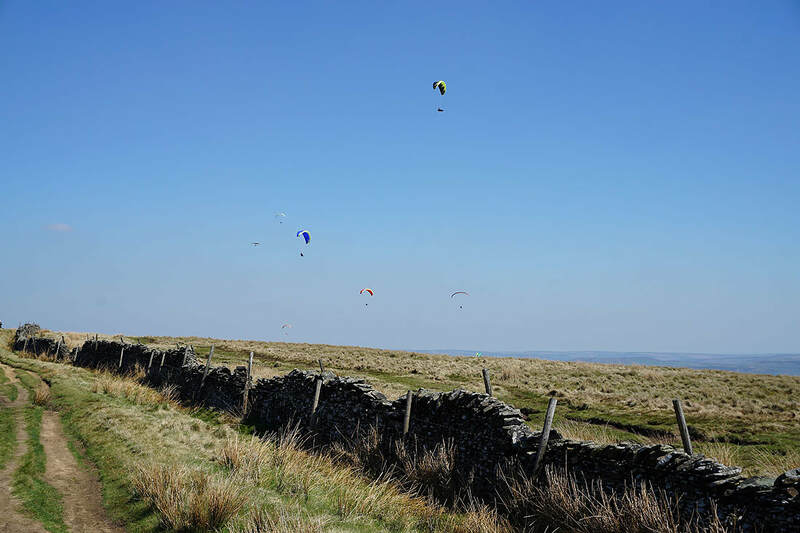 Now I'll see them up close. 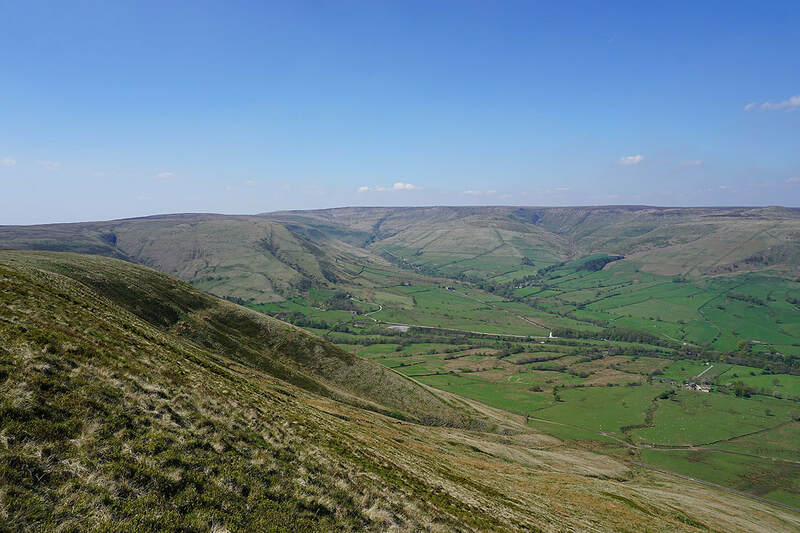 Time to take a break and admire the great view across the Vale of Edale from the top of Rushup Edge.. 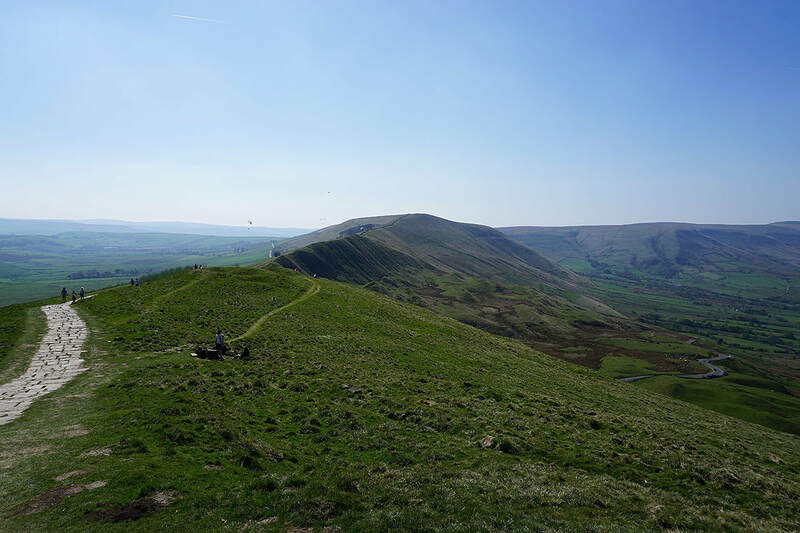 Heading along the ridge to Mam Tor.. 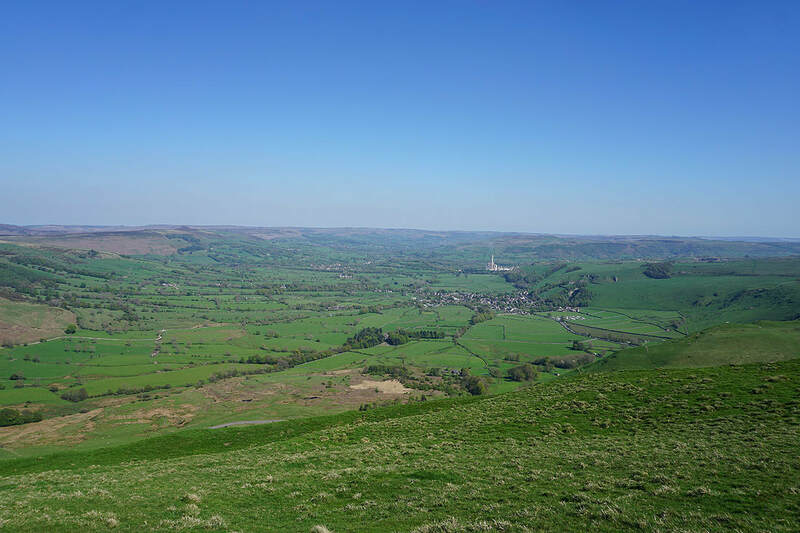 The head of Edale from Mam Tor. 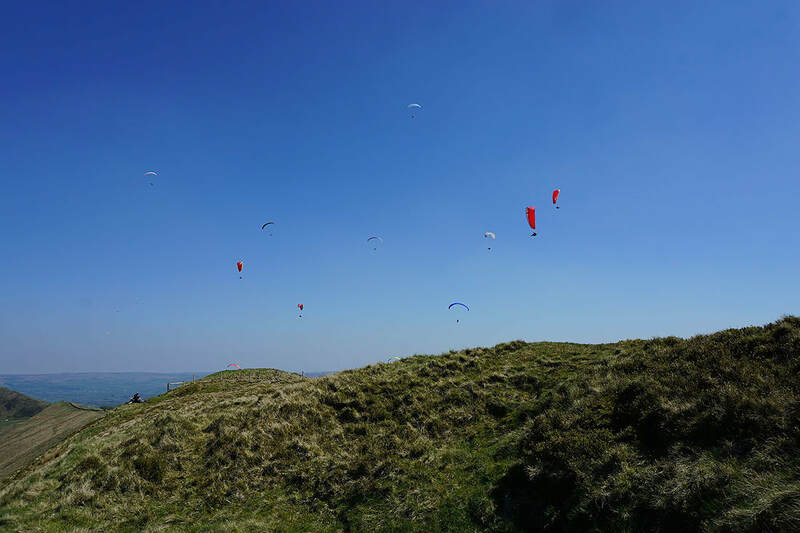 It was very busy, which wasn't a surprise. 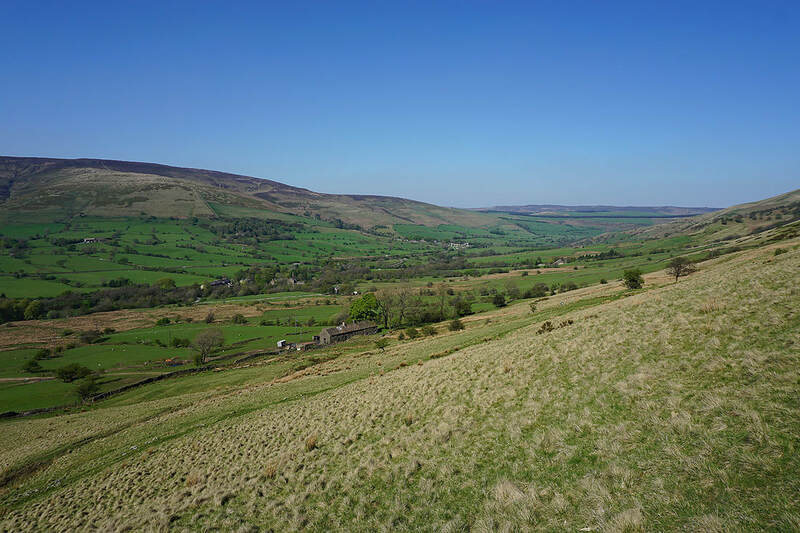 There's a fantastic view across the Hope Valley to my right.. 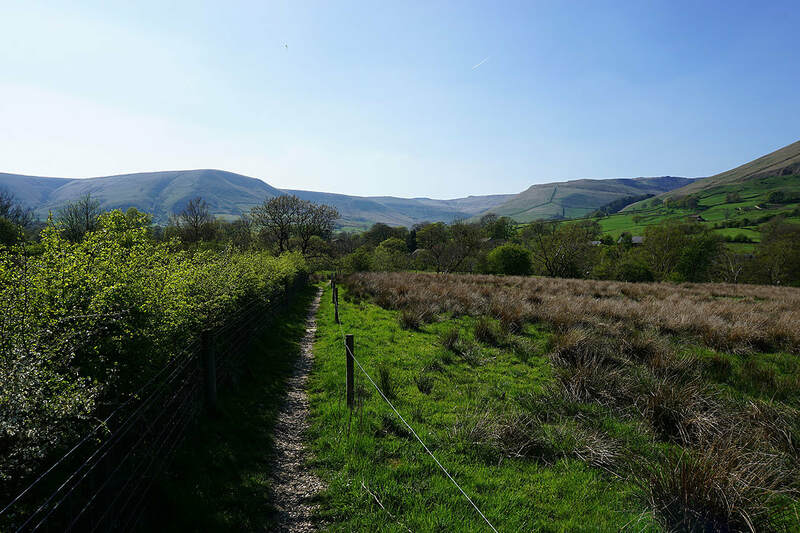 The Vale of Edale as I take the bridleway down to Greenlands..